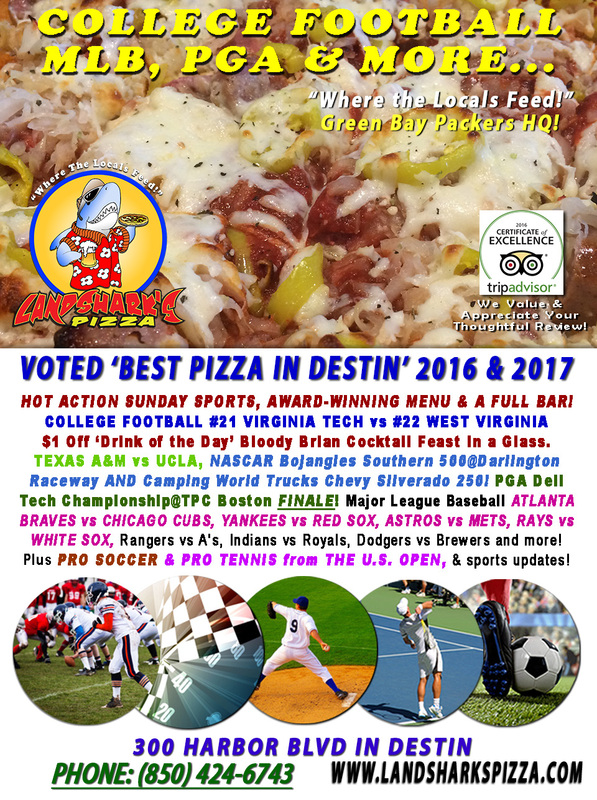 / Best Award Winning BBQ Destin FL / Super Saturday COLLEGE FOOTBALL $8 Pitchers|$12 Buckets, #1 CRIMSON TIDE vs #3 SEMINOLES, NASCAR & MLB! Super Saturday COLLEGE FOOTBALL $8 Pitchers|$12 Buckets, #1 CRIMSON TIDE vs #3 SEMINOLES, NASCAR & MLB! 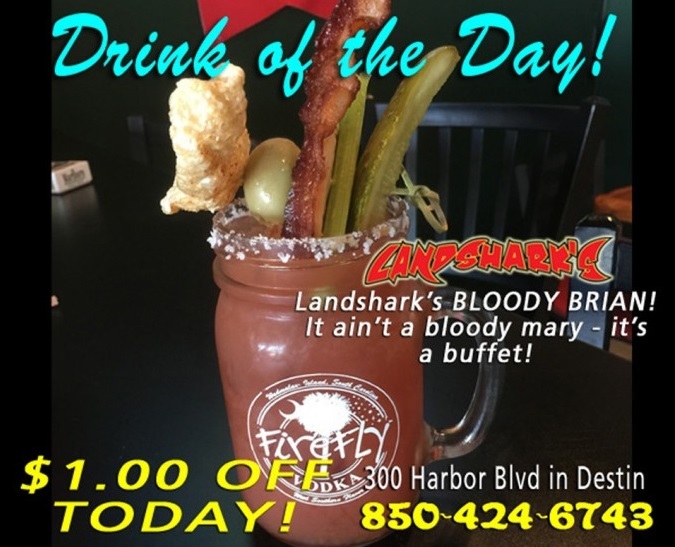 $8 Domestic Pitchers & $12 Domestic Buckets while you enjoy an action-packed Saturday with NCAA Football, NASCAR, Pro Baseball, Golf & more while you chow down at Landshark’s in Destin where we combine the hottest sports action with a huge menu of Award-Winning Pizza, Award-Winning Wings, Award-Winning BBQ, a Oven-baked Subs, Calzones, a smorgasbord of appetizers and a FULL BAR! 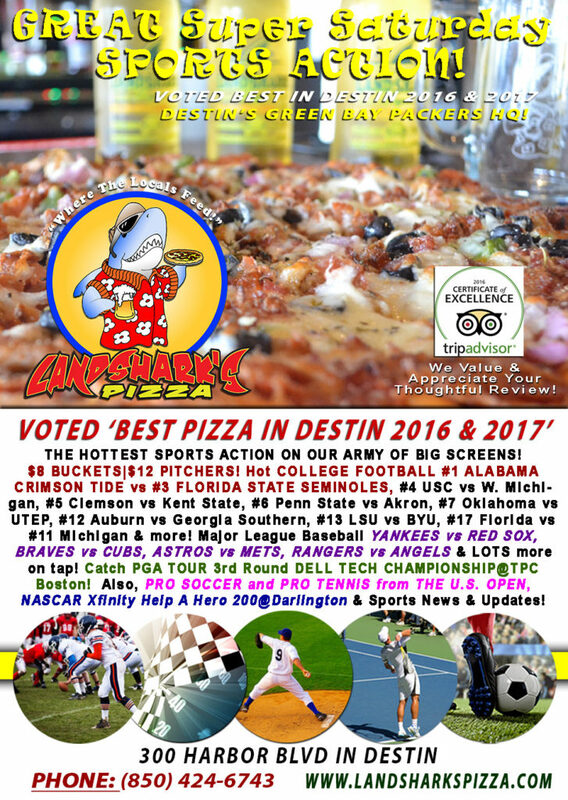 SPORTS ON OUR ARMY OF BIG SCREENS – COLLEGE FOOTBALL #1 ALABAMA CRIMSON TIDE vs #3 FLORIDA STATE SEMINOLES, #4 USC vs W. Michigan, #5 Clemson vs Kent State, #6 Penn State vs Akron, #7 Oklahoma vs UTEP, #12 Auburn vs Georgia Southern, #13 LSU vs BYU, #17 Florida vs #11 Michigan & TONS more NCAA pigskin! Major League Baseball featuring YANKEES vs RED SOX, BRAVES vs CUBS, ASTROS vs METS, RANGERS vs ANGELS, Rays vs White Sox, Indians vs Tigers, Nationals vs Brewers & lots more on tap! NASCAR Xfinity Help A Hero 200@Darlington Raceway. 3rd Round PGA DELL TECH CHAMPIONSHIP@TPC Boston! Also, PRO SOCCER and PRO TENNIS U.S. OPEN coverage plus plenty of other Sports Broadcasts, Sporting News, Analysis, and Commentary! NASCAR This Week: (Sunday) Monster Energy Cup Series Bojangles Southern 500@Darlington Raceway AND Camping World Trucks Chevy Silverado 250@Canadian Tire Motorsport Park. 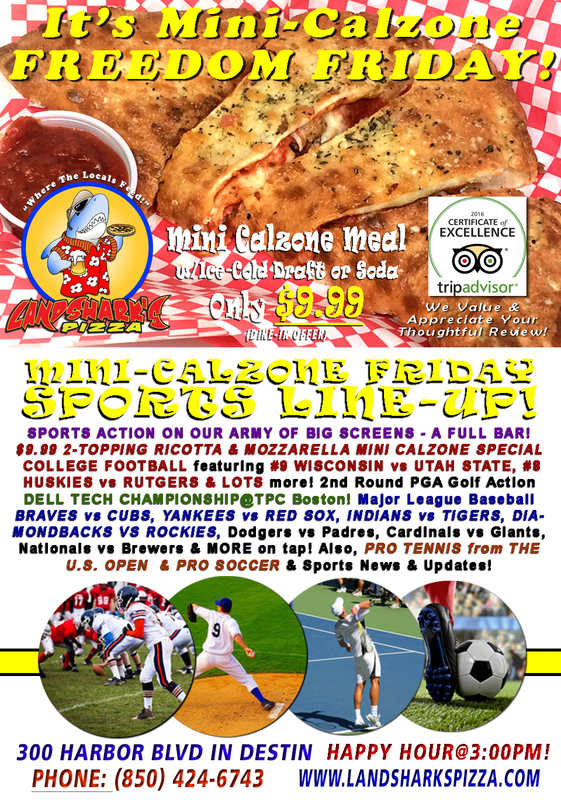 Previous Post: « COLLEGE FOOTBALL Freedom Friday #8 HUSKIES, #9 BADGERS, MLB & US OPEN|$9.99 2-Topping Calzone w/Beer!